A stir-fry is a healthy alternative to the traditional meat-and-potatoes meal, allowing you to offer beef or chicken but with fewer calories, less saturated fat and less cholesterol. In addition to a healthier dish, you can prepare a less-expensive meal with stir-fry using cheaper cuts of beef. The key to keeping this less fatty meat tender is to marinate the meat before and, and start it at a slightly lower temperature. Prepare a marinade for your meat. Traditional Asian marinades use soy or teriyaki sauce with an acidic fruit like pineapple or orange. 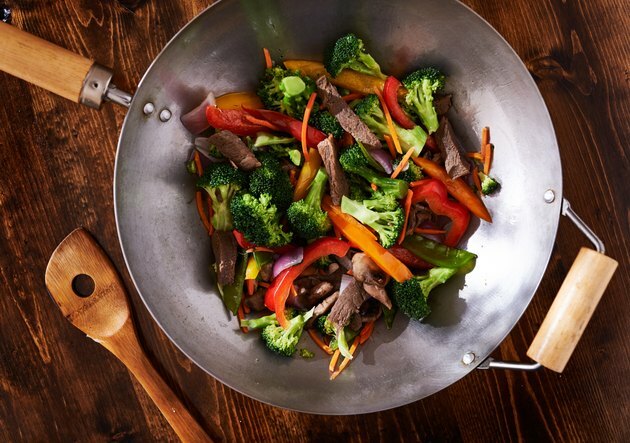 Celebrity chef Martin Yan recommends combining ingredients such as sherry or rice wine with soy sauce, ginger and corn starch, and marinating the meat for 10 minutes prior to cooking a broccoli beef stir fry. You can also buy marinades at your grocery store. Slice your meat into thin, bite-size pieces. Do so when the meat is cold to make it easier to cut. Choose chicken breast or flank or sirloin beef cuts for healthier stir fries. Marinate your meat less than one hour, since the smaller pieces will absorb the sauce more quickly than larger steaks or breasts, which often marinade for hours or overnight. Let your meat get to room temperature before you cook it. Heat your pan or wok to high. Add peanut oil or another monounsaturated cooking oil for a healthier dish. If you are using a nonstick pan or wok, use less than 1 tbsp. of cooking oil. Other pans may require more oil. Place the chicken in the pan or wok and let cook for one minute without moving. Flip the meat and cook for one to two more minutes, rearranging the pieces if your stove or range does not heat all areas of the wok or pan evenly. Lightly stir, but do not press the chicken, or you will lose juices that keep it tender. Remove the chicken from the pan. Add 1 tsp. of cooking oil to the pan or wok if there is no oil or juice in it; most often, you will not need to add any more oil to a wok or non-stick pan. Add a diced clove of garlic to the oil or juices to infuse this flavor into the liquid or fat, if you like. Add your vegetables quickly to the pan after adding the garlic and begin tossing, to prevent the garlic from burning. Stir fry until the vegetables become soft, or about one minute. Add the chicken back to the pan or wok, and stir the meat and vegetable mixture, adding any remaining marinade or introducing a sauce if you have not marinated the chicken. Cook for one to two minutes. Heat your pan or wok to medium high. Add cooking oil. Place the beef in the pan or wok and let cook for two minutes gently stirring. Flip the meat and cook for one or two more minutes, re-arranging the pieces for even cooking. Do not press the meat during the cooking process. Remove the meat from the pan. Raise the heat of the pan or wok to high. Add your vegetables and cook approximately one minute. Add the meat back to the pan or wok, and stir the meat and vegetable mixture, adding any remaining marinade or sauce. Do not press the meat as you lightly stir it with the vegetables. Do not place large amounts of meat in the pan at once if it crowds the meat together. Cook your meat in two batches if all of the meat does not touch the bottom of the pan.